The Masters is undoubtedly golf's most prized possession. The four-day tournament consists of the game's top players coupled with thousands of spectators who flock to Augusta for the entire week. With NBA and NHL playoffs yet to begin, all the national attention focuses on golf and just about every national media outlet has extensive coverage. 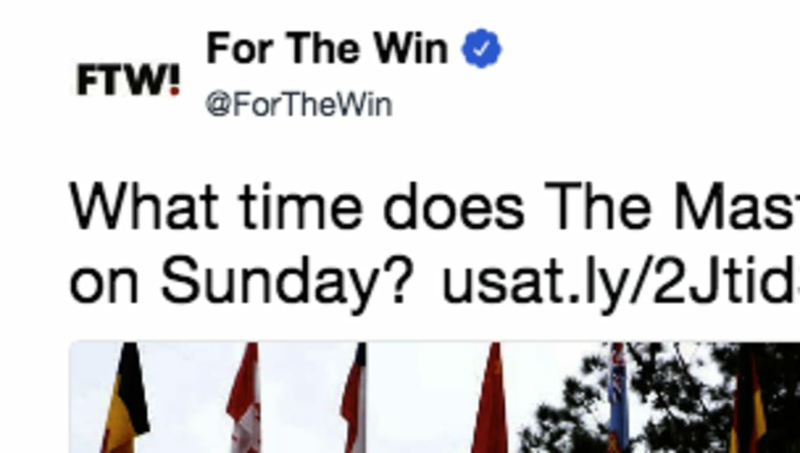 Whoever is running social media for For The Win might need to check on their automatic scheduled tweets. A post titled "What time does The Masters coverage start on Sunday?" was sent out as Patrick Reed captured his green jacket at 7 p.m. ET. To be fair, the post was published at 10:56 A.M. but the tweet was untimely, to say the least. While it didn't finish in a playoff hole or spectacular fashion, Sunday's round was the most exciting 18 holes of the four days. While Reed ultimately kept the lead to win, Jordan Spieth and Rickie Fowler stormed back into contention with strong performances. But while all of this happened, For The Win had you updated on the tee times, just in case. It may be time to delete the tweet by now, just sayin'.